(CNSNews.com) - The federal government collected a record $1,415,150,000,000 in individual income taxes through the first ten months of fiscal 2018 (October 2017 through July 2018), according to the Monthly Treasury Statement. But the federal govenrment also ran a $683,965,000,000 deficit for those ten months, according to the statement. 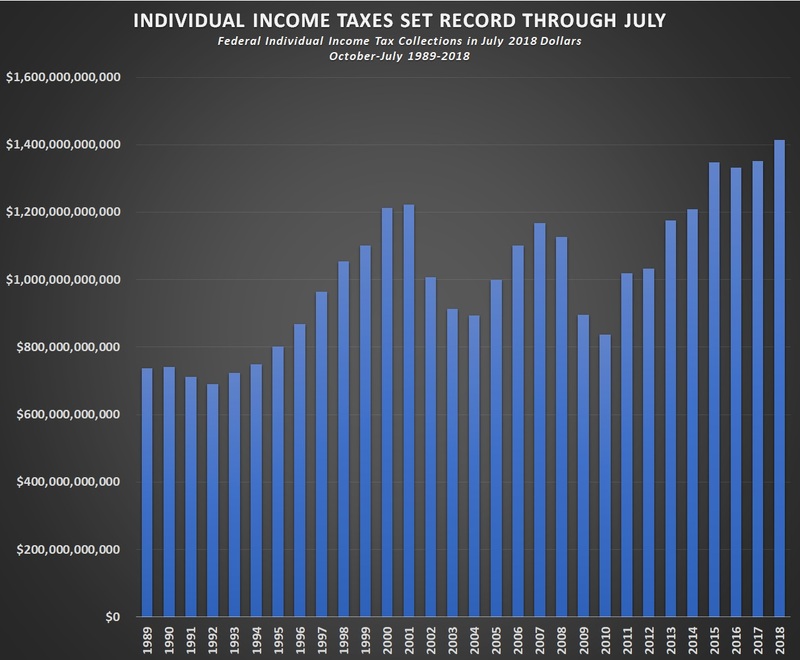 The previous record for individual income tax collections in the first ten months of the fiscal year was in fiscal 2017, when the Treasury collected $1,351,409,020,000 in individual income taxes (in constant July 2018 dollars) in the October through July period. Despite the record amount in individual income taxes collected in the first ten months of this fiscal year, overall federal tax collections declined in the first ten months of this fiscal year compared to last year. In the October-through-July period of fiscal 2017, the Treasury collected $2,820,673,610,000 in total taxes. In the October-through-July period of this fiscal year, the Treasury collected only $2,766,071,000,000. While individual income taxes collected in the first ten month of the fiscal year increased from 2017 to 2018, corporation income tax collections declined. In the October-through-July period of fiscal 2017, the Treasury collected $239,013,770,000 in corporation income taxes (in constant July 2018 dollars). In the October-through-July period of fiscal 2018, the Treasury collected $166,004,000,000 in corporation income taxes. In addition to the individual income taxes and corporation income taxes, the total taxes the federal government collected in October through July included $978,254,000,000 in Social Security and other payroll taxes; $70,755,000,000 in excise taxes; $18,761,000,000 in estate and gift taxes; $32,477,000,000 in customs duties; and $84,688,000,000 in miscellaneous revenues. 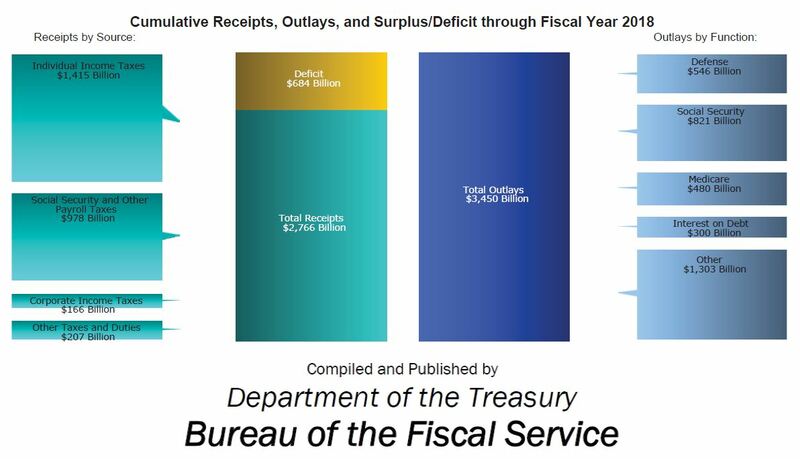 The federal government ran a $683,965,000,000 deficit in October through July of fiscal 2018 because while collecting its $2,766,071,000,000 in total taxes, it spent $3,450,035,000,000.